Clearly all Christians are called to ambassadors for Christ. An ambassador is an individual living in a foreign land representing the interests of their own nation. Their goal should always be what the best interest for their nation is and how to progress the interests of their nation. The nationality of all Christians, regardless of their location, is the Kingdom of God and Jesus is our King. As ambassadors for Christ our goal should always be, what the best interest of Christ is. When King Solomon was praying to the Lord in the dedication of the temple he asked of God to look not just upon them but also on the foreigner who would pray to God, “so that all the peoples of the earth may know Your name, and fear You as do Your people Israel” (II Chronicles 6:33). God’s heart has always been that all of His creation would turn to Him and trust in Him. The temple was a testimony of the power and the presence of God in the midst of His people. Today through Christ the New Testament teaches us that our bodies are now the Temple of God. (II Corinthians 6:19). God chooses to reside in us today through His Spirit for the same reasons He chose to reside in the Temple amongst the nation of Israel, so that the lost people of the world may know Him through His presence within us. As an ambassador we do not promote our own agenda, or our own plans, or even our own ideas. Everything we do points to the one of whom we represent. As Christians we are in this world but are not of this world. We are foreigners in a foreign land. This world is naturally hostile toward the things of God yet we are called to represent God in this hostile world. Paul told Timothy in II Timothy 3:12 “Indeed, all who desire to live godly in Christ Jesus will be persecuted.” When we simply try to blend in with the world and not allow Christ to shine through us we not only dishonor the Lord, we also do this world an injustice. The world thinks that their way of living is perfectly fine, that they are on the right track, and they have everything figured out. However, they will never find peace, joy or any sense of contentment in what this world has to offer. I believe that God has put a natural void in the heart of every man that longs for God and cannot be filled by anything else. When the people of the world see the joy, the peace, and the sense of satisfaction within the lives of Christians they are then confronted with the realization that something is missing in their lives. When we are ambassadors for Christ sharing the marvelous light of Christ we welcome the foreigner who has come to realize how brutal this world has treated him; the foreigner who is ready to give up his citizenship to this world and become a citizen of God. The church has now become the embassy welcoming him as a refugee-but more than that. Now that he has transferred his citizenship, he is a fellow citizen of the Kingdom of God-a brother in Christ. Apart from the ambassadors for Christ how would the foreigner ever know of Jesus marvelous light, how would he know he is welcome, how would he ever become a brother? He would be left to his doom. As a result of our saving relationship with Jesus Christ the bible teaches that all believers have direct access to the throne of God. 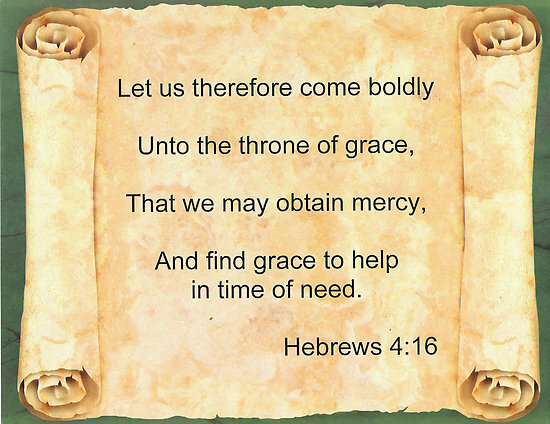 (Hebrews 4:16). James 5:16 tells us that, “the effective prayer of a righteous man can accomplish much.” We have no righteousness of our own. However, those who have trusted in Christ as their savior have a righteousness that is found in Him. (Romans 3:22). As we lift up or voice to God we are also encouraged with the great news that Jesus is the mediator between God and man. (I Timothy 2:5). So what does all of this mean? It simply means that through Christ we have direct access to the throne of the Father. The righteousness that is found in Christ is a perfect righteousness; therefore the prayers of a righteous man can accomplish much. Our prayers through Christ are powerful. Have you ever been told or even thought to yourself that someone is too far gone? As I stood at the graveside of my mother I tried to give the pastor who just finished preaching her funeral some money for his time and effort. He graciously declined but upon my persistence he said to me if I really wanted to give the money then I should come to church that Sunday and put it in the offering plate. I agreed and began to walk away. He then grabbed my arm to turn me back around and spoke these words to me, “Rusty I’m going to pray for you until you turn your life over to Jesus.” At that time in my life I was a drug addict that was consumed with anger, rage, hatred and bitterness. Not only was I a drug addict, I also considered myself to be an atheist. As he spoke those words to me I shrugged it off like it was nothing. Fifty-six day later I accepted Jesus Christ as the Lord over my life. We are never too far gone and there is great power in prayer; if we pray. The more we understand the Gospel the more we understand that the good news of God keeps getting better and better. The bible clearly teaches that God has saved us even though we are unworthy, and that He has called us into a calling that is set aside for His purpose; a calling of which He will provide our every need. Those two glorious gifts are worthy of our uttermost dedication and service to God, but that is not the end of the good news. As we continue to search the scriptures we find that through Christ, God has adopted us as His very own children and that we have become joint heirs in Christ Jesus. The bible says in Romans 8:14-17 “For all who are being led by the Spirit of God, these are sons of God. For you have not received a spirit of slavery leading to fear again, but you have received a spirit of adoption as sons by which we cry out, “Abba! Father!” The Spirit Himself testifies with our spirit that we are children of God, and if children, heirs also, heirs of God and fellow heirs with Christ, if indeed we suffer with Him so that we may also be glorified with Him.” Paul called himself many times in scripture a “bond-servant of Christ.”A bond-servant is a willing servant. God has not called us to serve Him as His unwilling slaves. He has called us to serve Him as His child. In this text of scripture all believers are called priests. This doctrine is called the priesthood of the believer. Some would argue that being a priest is for a select few. However, the Word of God clearly teaches that whoever has accepted Jesus Christ’s work of salvation has then been adopted into the family of God and now is a priest of God. A priest has many roles and responsibilities. However, they can all be summed up into one main purpose. A priest is to represent mankind to God. One of the greatest ways that believers can represent mankind to God is to pray for them. God expects His people who are called by His name to pray. Jesus is our High Priest. We see Him many times in the gospels praying for His disciples. Paul told Timothy in II Timothy 1:3, that he thanks God for him, as he mentions him in his prayers. As the priest of God serving mankind on behalf of God we should have a great burden for the lost and hurting. Many times I pray asking God to give me the compassion of Jesus. The compassion that calls out with a broken heart as Jesus did in Matthew 23:37 as He said, “Jerusalem, Jerusalem, who kills the prophets and stones those who are sent to her! How often I wanted to gather your children together, the way a hen gathers her chicks under her wings, and you were unwilling.” Despite the wickedness of their ways Jesus still loved them and desperately desired to see them repent and turn to His saving grace. With this same heart of compassion we are called to cry out to the Father with a broken heart on behalf of the lost condition of this world. I dare say that the bulk of our prayer should be directed to praying for the redemption of the wretched. I also dare to say, if we started praying in this manner we will see revival. The bible also tells us that God requires death as the payment of our sins. (Romans 6:23). Death had to be paid as a penalty of sin, but praise be to God that I Corinthians 15:3 tells us, “Christ died for our sins.” We should have paid the penalty of our sins but Jesus stood in our place. Although we have turned our back on Him time after time, God loved us enough to send His Son to become sin for us. II Corinthians 5:21 say, “He (God) made Him who knew no sin to be sin on our behalf, so that we might become the righteousness of God in Him.” Due to this great sacrifice John said in I John 1:9 “If we confess our sins, He is faithful and righteous to forgive us our sins and to cleanse us from all unrighteousness.” No one is worthy of this great gift of sacrifice. We deserve death and hell, yet God gives us grace by giving us His Son. Because of the mercies of God I will gladly surrender myself to Him in full submission. Because of the mercies of God I will gladly serve Him with full sincerity counting it an honor. Because of the mercies of God I will gladly give my life as a living and holy sacrifice, acceptable to God. As I sit down to write this I am mindful of the moral collapse that is plaguing or nation. Inner city crime has spread to small towns and communities all across America, drugs have become an epidemic problem that virtually every family in America is dealing with, and sexual perversions of every kind have become socially acceptable. We pick up video cameras and idly watch while people are murdered, raped, and beaten instead of lending a helping hand and then use the video as a form of entertainment. School shootings, the knockout game, and all sorts of acts of violence are no longer random; they have become all too common. When the tragedies come we ask, “Who is to blame?”, “Who’s responsible for this great tragedy?” We first start pointing our fingers at the parents saying they are to blame, then to the schools noting that they should have had better security or should have been more aware of their student’s activities. We even want to pass the blame on the guns themselves desiring to sue the gun manufacturers. We say we need better laws or better politicians who will write better laws. Christians love to pass the blame onto the ACLU and those “Liberal” activist judges. “They have kicked prayer out of school” we say. But, are we praying at home with our children? We fuss “They have removed God’s Word from the schools.” But, are we teaching our children God’s Word at home? We want to pass the buck but who has God given the responsibility to? A passage of scripture I have often found intriguing is in Mark 14:17-21. Jesus was having the last supper with His disciples when He said to them, “One of you will betray Me.” What I find so intriguing about this text of scripture is the fact that Peter didn’t say “I know it’s John I never really trusted him all that much anyway.” Nor did John say no “it has to be Matthew, you know he use to be a tax collector.” Instead each one turned to Jesus asking “Surly not I.” They weren’t passing the blame; they just wanted to make sure they were staying in right relationship. One of the major downfalls of modern society is that we are unwilling to accept responsibility for our own actions. Instead we want to find someone else to pin it on. It seems as though taking responsibility for your own actions has gone the way of the ancient word. However, when it comes to the spiritual condition of this world there is only one institution that God has granted power and authority to; the power and authority to overcome the spiritual forces of wickedness and tear down the gates of Hell. It is the church. Jesus said in Matthew 28:18 “All authority has been given to Me in heaven and on earth.” He then said in the next verse of the same chapter, “Go therefore and make disciples of all the nations, baptizing them in the name of the Father and the Son and the Holy Spirit.” Out of the same breath that He said I have all authority, He said Go. In other words we, the church, should go out into the world with the authority and the power of Jesus making disciples, which are followers of Jesus. Jesus also told the church in Matthew 16:19, 20 “I will give you the keys of the kingdom of heaven; and whatever you bind on earth shall have been bound in heaven, and whatever you loose on earth shall have been loosed in heaven.” If the power of God is not falling down upon this earth to change the heart of man and transform him into whom God so desires him to be there is none other to blame than the church. The church is the only institution that God has chosen to work through. There is no other. Therefore if the church is not fulfilling the callings that God has placed upon them heaven will be bound. God did not say if the government, or if the school systems, or if the laws, or even if society gets right that He would heal the land. He said, “if my people who are called by My name.” God has given the call, He has given the authority, and He has given the power. We simply have to accept it and walk in it. (An excerpt from Reclaiming the Land: God’s Formula for Revival). The clear teaching of the Word of God is that we are saved by grace and not of works. We simply make a choice to repent of our sins and believe on Jesus for His redemptive power. At that moment the power of God unto salvation is worked out by God within our lives. We are fully dependent upon the power of God to convert us and then regenerate us. “Therefore if anyone is in Christ, he is a new creature; the old things passed away; behold, new things have come.” (II Corinthians 5:17). The fact of God’s power at work in our lives for salvation is undisputed among bible believing Christians. However, we often fail to realize the continual need of the power of God in our lives after salvation. The redeemed child of God cannot obtain the holiness of God within his life apart from the power of God initiated it. Are we saved by grace apart from the law and works only to be saved and left to our own devices to live out our salvation in accordance to the law and works? Of course not. Ephesians 4:24 says, “put on the new self, which in the likeness of God has been created in righteousness and holiness of the truth.” To put on the new self is to put on Christ. (Romans 13:14). Apart from the power of God at work in our lives we cannot be saved. Likewise, apart from the power of God in our lives we cannot obtain the righteousness and holiness God requires as Christians. We start of fully dependent upon God’s power and remain fully dependent. James 2:18 says, “But someone may well say, “You have faith and I have works; show me your faith without the works, and I will show you my faith by my works.” James is clearly not arguing that one needs works to have faith. Rather, he is arguing one needs faith to have works. Even in our works we are fully dependent upon God’s power. We often quote Ephesians 2:8, 9 declaring that we are saved by grace through faith and not of works. This is a vital truth for true salvation. However, we often forget about the next verse, Ephesians 2:10 says, “For we are His workmanship, created in Christ Jesus for good works.” We are clearly not saved by works but are clearly expected to work. We are not to work in our own power, for that is boastful and arrogant before God. Act’s 1:8 says, “But you will receive power when the Holy Spirit has come upon you; and you shall be My witnesses both in Jerusalem, and in all Judea and Samaria, and even to the remotest part of the earth.” You will receive power to do the work in which God requires. Jesus said apart from Me, you can do nothing. (John 15:5). Just as we are full dependent upon God for salvation, we are fully dependent upon God for righteousness, for holiness, and for our good works. Praise God just as He saves those who believe in His name, He will empower those who continue to do so. Every man woman and child stands in need of the grace of God. God has given to us His law as a standard by which we are to live. However, the Word of God clearly teaches that all in one form or another have broken the law. Because we are lawbreakers we await judgment, a judgment that will lead to eternal damnation. However, God is not willing for any to parish but for all to enter into repentance. For this reason God sent His Son, Jesus, to pay the penalty on the cross of our judgment. Apart from the grace of God we are utterly hopeless. Jesus said in Mathew 5:20, “For I say to you that unless your righteousness surpasses that of the scribes and Pharisees, you will not enter the kingdom of heaven.” The scribes and Pharisees, although lawbreakers themselves, prided themselves in keeping the law through their ritualistic routines within their daily lives. How then is our righteousness going to surpass the righteousness of the scribes and Pharisees? It cannot. Thus, we need another means to enter the kingdom of heaven. “For by grace you have been saved through faith; and that not of yourselves, it is the gift of God; not as a result of works, so that no one may boast.” (Ephesians 2:8, 9). So often we overlook and therefore take for granted how great the gift of grace truly is. The greater we understand grace, the more we will come to realize what a treasure Jesus truly is. The grace we have received is through God giving His Son as a gift. Although we are sinfully blemished and undignified God gave us His Son who is sinlessly perfect, unblemished, excellent, and dignified in every way. “He made Him who knew no sin to be sin on our behalf, so that we might become the righteousness of God in Him.” (II Corinthians 5:21). God gave to us, whose righteousness is as filthy rags, His Son, the King of Glory, the Ancient of Day’s, the one in whom the angels in heaven worship, the one in whom all things was created for. God gave to us, mere men, His Son, His only begotten Son, His Son of whom he loves, His Son who is near and dear to His heart. What a wonderful treasure we have received in these earthen vessels; a treasure that outshines all others; a treasure worthy of giving all to receive, yet a treasure freely given. A treasure we are unworthy of receiving, yet our God, a God of grace, gladly, and lovingly gives. A treasure we should share with those whose treasures have tarnished. Truly Jesus, given by grace and received by faith, is the greatest treasure.